A Honeymoon in Botswana is the ultimate romantic getaway. Your days will be spent on safari exploring the wild, pristine wilderness of Africa and your evenings will be filled with romance – exclusive private candlelit dinners under the African stars, right in the heart of the African bush. The intimate, small and exclusive lodges, allow for personalized service and attention to the smallest detail. Lodge staff are passionate and committed to making your dream African honeymoon a reality that will be cherished for a lifetime. Upon your arrival at Livingstone or Victoria Falls Airport, you will be met and welcomed by a representative from Chobe Game Lodge. You will be transferred by road to the Lodge, where you will spend three nights. Experience this legendary lodge made famous by Richard Burton and Elisabeth Taylor who celebrated their second wedding at Chobe Game Lodge. After settling into your luxurious Honeymoon Suite, you will have time to freshen up and relax. Enjoy a delicious lunch served on the terrace restaurant overlooking the Chobe River. Set out on your afternoon game activity – a sundowner cruise on the magnificent Chobe River or an exciting game drive exploring the Chobe area. Sunset Cruises are spectacular as you will be able to view wildlife that congregates at the water’s edge and enjoy a spectacular African sunset. The Chobe National Park is famous for its huge herds of elephant and buffalo and magnificent star-gazing. 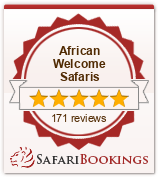 Your professional guide will be happy to show you the African skies, explaining the stars while sharing local folklore. Chobe Game Lodge facilities include a riverside boma where traditional dancers perform, a large swimming pool, a stylish cigar bar with an outside terrace overlooking the Chobe River. Chobe Game Lodge also has wildlife reference library with lounge and terrace. Should you wish to pamper yourself whilst on honeymoon, you can schedule an appointment with the in-house beautician. Enjoy a leisurely breakfast before you transfer to Kasane Airport. Depart on your scheduled charter flight to Savute Safari Lodge, situated inside the world renowned Chobe National Park, where you will stay for two nights. Savute is known for its incredible predator activity and abundance of wildlife. A handful of small pans sustain Savute’s thousands of animals with a permanent, yet fragile, water source. On your game drive, experience magnificent bull Elephants shuffling past you as you sit in your open vehicle. All drives are led by professional guides who have incredible knowledge of the Savuti area. Savute Safari Lodge has 12 twin-bedded luxury wood, thatch and glass safari suites, well-suited to the hot and dry conditions. The suites have spacious interiors, glass sliding doors, private viewing decks and en-suite bathrooms. Facilities at Savute Safari Lodge include a lounge, library and cocktail bar, which are situated in the exquisite thatch and timber main building. A viewing deck is ideal for watching game at the water hole. A swimming pool on a raised wooden teak deck overlooks the channel. After a day out in African bush, cool off with a dip in the plunge pool or sip a cocktail on the viewing deck. Enjoy a romantic candlelit dinner on your private deck. As the sun sets, you will watch animals drinking at the water holes situated in front of camp. Listen to the sounds of the African night as you enjoy your delicious meal. After an early morning activity and breakfast at Savute Safari Lodge, you will connect with a light aircraft for your flight to Xugana Island Lodge, where you will stay for two nights. Xugana Lagoon is in the permanent Delta situated in the Okavango Delta, a world of crystal clear waterways winding through vast reed and papyrus beds and opening onto tranquil lagoons. Located in a private concession, Xugana is a true water -based camp. Xugana Island Lodge has only eight chalets which are raised on wooden decks. Each chalet has ensuite bathrooms and private decks which overlook the lagoon. Xugana Lagoon offers magnificent African sunsets. The lodge has an open boma and outdoor dining area. The lounge, bar and dining areas are set back under an Ebony and African Mangosteen tree canopy. The swimming pool, in the centre of the island is a perfect place to relax. After a delicious lunch, you depart on your afternoon game activity. Enjoy a boat cruise and even try your hand at some fishing for bream and tiger fish. Enjoy tranquil mokoro trips in eco-friendly dugout canoes, combined with adrenaline pumping walks on surrounding lagoons and islands in the concession. A romantic dinner for two on the famous floating deck, with a magnificent sunset view, will leave you with everlasting memories of the Okavango Delta. Enjoy a morning activity before departing on your scheduled charter flight to the desert location of Leroo La Tau, where you will spend two nights. Leroo La Tau is built on 15m high cliffs above the dry Boteti River which gives guests opportunities for spectacular wildlife sightings from this raised vantage point. The main reception and lounge areas sit high on the cliffs overlooking the Boteti Riverbed and the sweeping scrub and grasslands of the Makgadikgadi. Luxury glass and thatch chalets on individual raised wooden platforms provide unsurpassed views over the dry riverbed and grassy plains. From the pool you can watch the herds of zebra and wildebeest that congregate to drink from the waterhole. View animals on day and night game drives and perhaps see Lion, Leopard, Cheetah, Brown and Spotted Hyena and maybe even the rare White Rhino. Take part in a memorable tree planting ceremony where you will plant your own tree. A unique gesture where you will contribute to the preservation of the natural environment in Africa – for present and future generations. After a morning activity and breakfast, you will be transferred from Leroo La Tau to Maun Airport for your onward arrangements. Unforgettable memories, newfound friendships and the promise of a return journey to Botswana ever close to your heart. Click on costs tab for inclusions and rates Honeymoons are to be remembered! Visit our Honeymoon page for more Honeymoon ideas.